The California Public Employment Relations Board, or PERB, the state agency responsible for adjudicating allegations of unfair labor practices, has a large backlog of cases, which has more than doubled the amount of time it takes to process them. Unions representing UC employees, which can file those cases, are feeling the brunt of the effects, with response times sometimes reaching a year — a scenario that may spur employee strikes. “When there’s a dispute between employers and employees during collective bargaining, the PERB adjudicates the dispute,” said Nick Schroeder, senior fiscal and policy analyst for the Legislative Analyst’s Office, or the LAO. 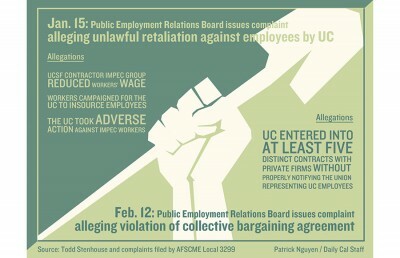 In February, PERB alleged that the university violated its collective bargaining agreement with the American Federation State, County and Municipal Employees Local 3299 — the university’s largest employee union — by entering into or extending about five contracts with private companies without properly notifying the union. Gov. Jerry Brown proposed in January an increase in PERB’s budget of more than $1,000,000 for fiscal year 2016-17, aimed at funding new positions and an office relocation. On March 1, the LAO released a report on PERB funding detailing how the board has been crunched by its increasing jurisdiction and a relatively stagnant budget. The report could not determine whether Brown’s proposed increase in PERB funding would be enough to ameliorate the board’s backlog. When the board was established in 1976, it oversaw roughly 470,000 state employees. Since then, its jurisdiction has grown to cover about 2.3 million state employees — more than 400,000 were added in 2012 alone. According to PERB’s 2016-17 budget proposal, an optimal time for case processing is 60 days. In 2015, the board took 137 days on average to process its most common case, an allegation of unfair labor practices, according to Felix de la Torre, general counsel for PERB. A long delay in the system can lead to a breakdown in the relationship between employers and employees, Schroeder said. The report documents how the board has kept positions vacant to redirect funding to pay for costs associated with personnel, operations and equipment. PERB kept one of the five seats on its decision-making board vacant, for example, because it was able to use the seat’s $140,000 salary for other expenses, according to the report. The University Council-American Federation of Teachers, the universitywide union for lecturers and librarians, has seen cases take anywhere from three months to a year to process, according to UC-AFT Legal Director Bill Corman. The state budget will undergo revision over the next few months, with the state Legislature set to pass a finalized version by June 15.